Liquid: Weekly Photo Challenge Ben Huberman at WordPress posted the challenge for us to “keep it fluid”. Summer portraits of Maura today. Three grandkids from two families visiting. Today is her day. 70-200mm canon L series lens. Maura loves arts and crafts, swimming, piano lessons, dancing, going to the Children’s Museum in Pittsburgh and taking good care of her dolls. She brings a lot of energy and spirit to the party, that is for sure! Have a wonderful birthday, Maura. Hope you like your birthday blog. You can always check out some more photos of when you were little here on your 6th birthday blog. What happened to ‘ I think I’ll be six forever and ever”? I was astounded by the huge amount of donations at the Ohio State natatorium on Sunday afternoon where I attended the 2016 Thanks for Giving Fall Classic Swim Meet & Food Drive. Four of my grandkids swim for the hosting Ohio State Swim Club. Seeing these overflowing containers was a reminder to not only be grateful for all I have but to remember people in need. The swim meet announcer read the statistics of who is hungry and it is painful to know. Witnessing the swim families’ generosity and knowing people are hungry and rely on the donated food was a sight I wanted to share. Count the places you see numbers. Parting shot from afar, through the glass window of the Natatorium. Doesn’t look like 50 meter length from this angle. The pool was divided up into sections. Two events Saturday ,Three events Sunday. GO ANNA!!! Lots of gatherings documented throughout the course of a year and a few from years ago. The group photos pose a challenge, getting everyone with you simultaneously. I’ve included some more candid shots. Lucky us! Happy Twelfth Birthday Anna Catherine! One October morning before dawn, you made me and Marlene happy grandmothers. Loved by your family and friends, your loving heart and kind spirit come out in your eyes. 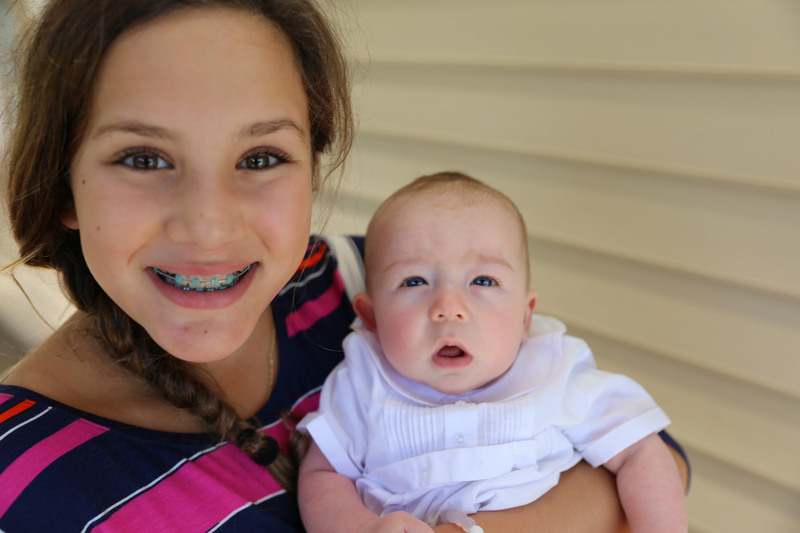 Anna holds her cousin Charlie- Sunday Oct 4th. Hula Hooper Anna video from five years ago.